Here is a frightening prediction: over the next decade, the number of children in private schools will increase from one-sixteenth to one sixth of all learners in South Africa. That proportion will then level off because other parents who prefer private education won’t be able to pay for it. As the State will not have the money to subsidise new independent schools serving poor communities, for-profit low-fee schools will constitute most of the new growth in the private sector. However, these “low fees” will still only be afforded by the wealthiest 40% of parents. Private education chains will cherry-pick the best teachers. Those competent and committed educators who choose to remain in the public sector will carry an ever-growing load and battle with burnout. Ultimately, most government schools will become known as schools for the poor. I can see into the future only because the same situation is playing out right now in the health sector. The same families who can afford private schooling can pay for medical aid – and that fraction has been stuck at about one-sixth of the population for many years. Not coincidentally, that’s the proportion of skilled workers in the labour market, who earn higher incomes and can choose their medical care and to which schools to send their children. Any marginal increases in the skills pool will benefit private medicine and private education. So we are stuck in a vicious cycle. Even if the quality of public sector education improves – and that’s a big ‘if’ at this time – that won’t change the fact that children in the poorest 60% of schools will continue to do worse than those in the top two income quintiles. That rising tide won’t lift all boats equally because the prevailing differences in resourcing and learner ability are just too great. There is no way to change the shape of the quality curve in education without investing substantially more in the poorest schools – not just money, but time and expertise as well. The problem is that the State has no more money, circuit managers don’t have enough time, and educational expertise is too thinly distributed to concentrate additional effort in all the schools that need it. This is the challenge that led a group of funders to propose an experiment in public schooling. Many of these funders have had their fingers burnt throwing money at the problem when the underlying causes – poor management and teacher demoralization – didn’t change. The funders offer a sustained process of support to tough schools in poor communities to give their learners a real chance of success in life. The experiment involves doing things differently. It expands the school governing body to bring in non-profit civil society organisations as school operating partners. It makes teaching more flexible so that children are taught at their actual levels of understanding and not where they are expected to be in any particular grade. It builds school leadership and motivates and develops teachers. Significantly, it gives parents the right to decide whether or not they want to be part of the experiment. Together with the education department, the entire parent body holds the operating partner to account. Each school parent body decides when to review the school’s performance and whether to renew or terminate the contract with the school operating partner. Critics of the pilot project scoff at the idea that parents might turn down extra funding and suggest that there’s really no choice being offered at all. That is a patronising view. After two years of working in these schools, our experience is that parents know what they want and agonise over the risk of their children being let down yet again by empty promises. Interestingly, parents at the most politicised schools have opted for a “fifty-fifty” relationship on the SGB – no less, no more – making it clear to the school operating partners that they will be equally accountable for the failure or success of the school. This process has involved parents more actively and given them more hope than exists in thousands of dysfunctional school governing bodies (SGB’s) across the country. 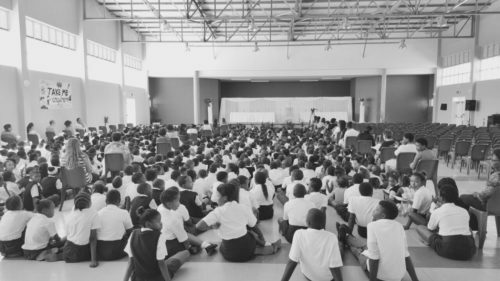 The national Department of Basic Education is currently considering amendments to the Schools Act to tackle these weaknesses. This experiment shows how SGB competence and democratic accountability can be built at the same time when provision is made for local flexibility. One would have expected this initiative to be welcomed by activist groups such as Equal Education (EE), committed to improving public education in South Africa. Unfortunately, EE has taken the view that this project represents the thin end of the wedge of privatisation. Let us be clear about the prospects of the children at the schools in the pilot project. In the Western Cape, as in the rest of the country, about 40% of children will drop out before completing Grade 12. Typically, these are the children who have repeated numerous grades and they eventually give up. In some of the pilot schools, the situation is even worse, where the majority of children are functionally two to three grades behind their age-peers at other non-fee paying schools. Unless we intervene now, only one in ten of these children will end up passing matric. We are talking about schools that hold no possibility of profit for commercial operators. Equal Education appears to be taking its cue from international anti-privatisation movements which play an important role as watchdogs for the public good. But they are often trapped in workerist narratives that fail to accept that non-profit civil society can be more than a critical spectator in the provision of public services; it can be a player as well. By their very nature, these global movements lack local specificity and are not accountable to the parents and children desperately seeking good quality education today. Does it have a problem with tax-financed public education delivered by non-profit providers? If so, why? Does it believe that the current structure of school governing bodies is working for all schools in South Africa? If not, how does it see change happening if we do not make the space to test alternatives to the present structures, which may be different but still democratic? Certainly, in its sustained opposition, Equal Education is being indifferent to the views of the parents who have voted overwhelmingly to participate in the experiment of Public School Partnerships. First published in the Cape Times on 2 November 2017. Additional reading: Collaboration Chronicles is a bi-termly publication featuring the learning that is emerging from the Collaboration Schools Pilot Programme. Have a look at the September issue here.